A lot of people have been wondering how Indochino will start 2013. It has been a while since the last big collection (The Deco Collection in September 2012) and expectations are high. Let's talk a closer look at the new Ultimate Tech Collection and find out more. 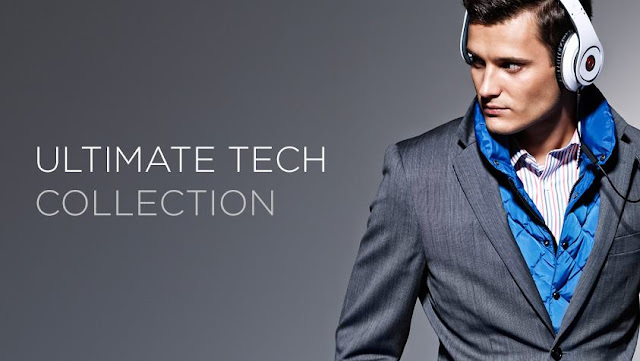 The Indochino Ultimate Tech Collection draws strong inspiration from the successful Traveling Collection in 2011. The Traveling Collection came with a number of fresh ideas: teflon coated, wrinkle resistant fabric, headphone ports, a touch enabled "smart pockets" and a plethora of pockets. I had one of those suits then and I was really impressed with a couple of these features. It sold out pretty quickly in 2011. Today's collection shares some of these innovations, but the concept overall has been improved and Indochino has focused on those ideas that really make sense. The entire Ultimate Collection includes three Nanotech suits (and vests) priced at $629, two Merino wool (80%) and Silk blend (20%) suits (and vests) at $499, two new silk linings and ten premium shirts made from Thomas Mason and Cotonificio Albini fabric ($159-$169). The new Merino wool/Silk blend suits are interesting designs and a good addition to the portfolio, but the real highlight are of course the "tech suits". Using a blend of natural and technologically advanced fabrics, the Nanotech suit repels liquids and stains, and resists odors and wrinkles without compromising on breathability or comfort. The touch responsive Smart Pocket enables the smooth operation of a smartphone from inside the jacket. The waterproof and dry-clean friendly pocket also comes with a metal earphone cable clip and rubber earphone hole to keep the user organized, untangled and hands free. The detachable Storm Flap is a unique and stylish way to protect your neck and chest from cold weather and replaces the traditional winter scarf. This lightweight accessory is filled with White Duck’s Down to provide superior insulation using natural body heat and buttons easily into the inside of the jacket. Indochino cleverly took the best ideas and learnings from the Traveling Collection and improved them for the Ultimate Tech Collection. Where the Traveling Collection contained perhaps too many gadgets, the Ultimate Tech Collection is nicely focused. The use of nanotech for the fabric is a clever way of making the fabric more resistant without actually using lower quality fabrics including polyester or other artificial materials. In fact, the quality of the new fabrics has improved considerably when compared to 2011. While many people will still prefer to wear mostly untreated fabrics, there is a place for a nanotech fabric - think of long travels, restaurant dinners, etc. 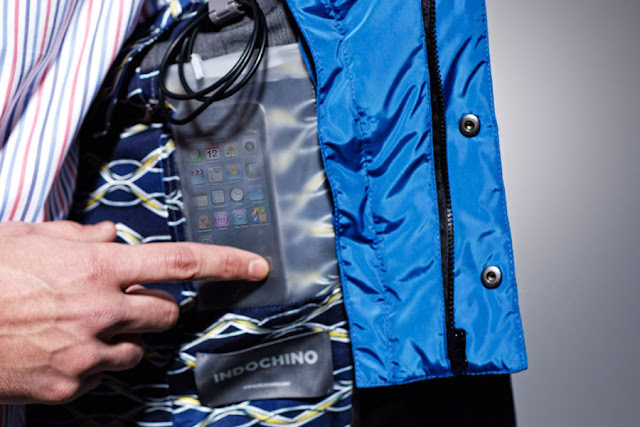 The fabric can be dry-cleaned safely but according to Indochino dry cleaners should take extra care with the smartphone pocket. Most of you will know to avoid frequent dry cleaning anyway - in most cases a brush and hanging the suit near the window or in the bathroom (steam gets rid of the wrinkles) will do. The smart pocket is another feature that adds value without interfering. Phones like the iPhone 5 are slim and light and won't appear too bulky in your suits pocket. You can also cleverly lead the headphones through the lapel - the look overall becomes more tidy and the headphone cables don't disturb. The cable clip is a clever way of storing away the headphones. The storm flaps are a really innovative idea. Clearly, a lot of thinking went into developing this idea. From a style perspective, I predict they will be controversial. The look kind of reminds me of wearing a gilet under the jacket, but without the bulk on the body. 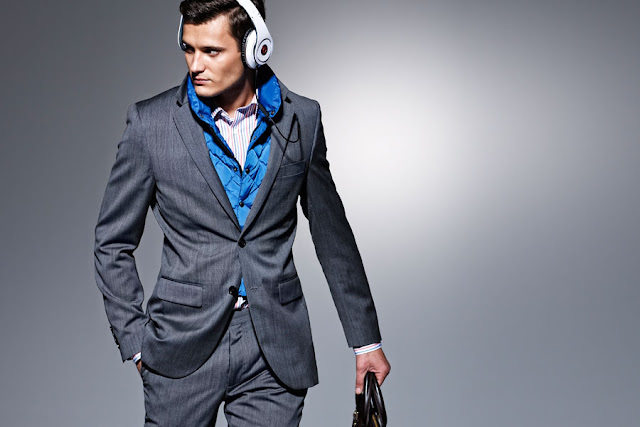 It will upset the traditionalist, but Indochino has never been afraid of trying bold ideas. They can easily be removed, by the way. The new shirts contain some really interesting designs, nice pinstripes without being too bold. The price point of the shirts is still discussed very controversially. At the end, what you pay for is the superior fabric. I will order one of the suits and a shirt and put up a review as soon as possible. Actually, I will be traveling South East Asia and Asia for a while this year and I plan on visiting tailors and shoemakers. If you have any recommendations for Vietnam or Thailand, please let me know!